One indisputable fact is that we are all going to die. No matter how virtuous we are, how healthy we may be or how intelligent we are, we will not escape death. Yet for something that is so definite, we are constantly surprised by or ill-prepared for death. 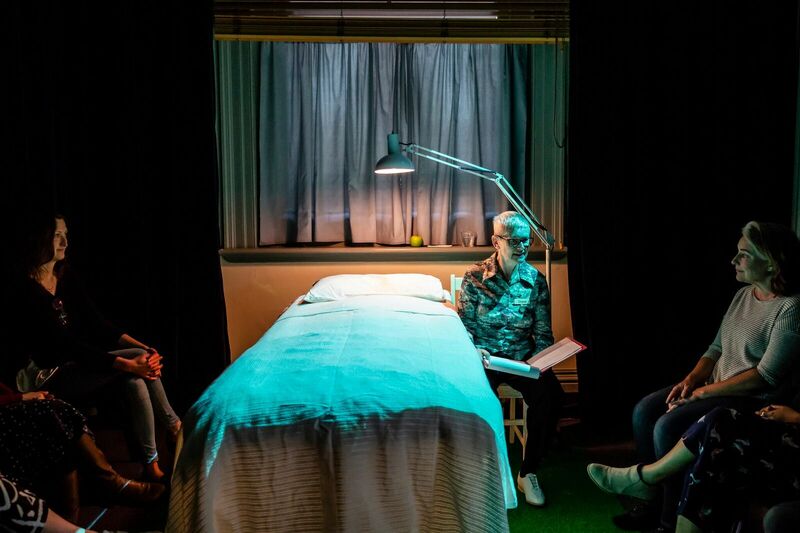 Presented as part of Arts House's Mere Mortals season exploring death, Peta Murray's vigil/wake is a pair of works that has us questioning what we know about death and how we remember those who have died. The first part, vigil is delivered as an illustrated lecture with Murray presenting facts and statistics on death in a relaxed and personable nature. The six audience members are seated around Murray and an empty made-up hospital bed. We are informed of various facts to do with death; the biggest killer of men in their 20s and 30s is suicide and the older we get, the higher the risk of heart attacks ending us becomes. As Murray explains the various ways in which 95% of Australians are not prepared for their final days, such as having unwritten wills or not having a playlist for their funeral, she also shares her stories of her mother dying ten years ago, thus allowing us to connect on a deeper level with what Murray is saying and to then relate it back to our own experiences and preparedness with death. Being 35 years old, I feel fortunate enough to have only attended two funerals my entire life. Yet while I've never really been impacted by death, I have always had a deeply rooted fear attached to dying. 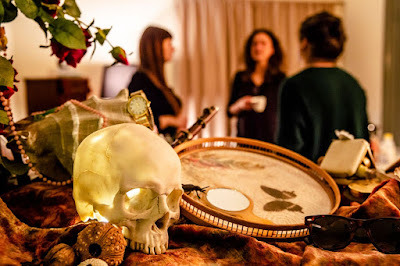 Through vigil, we are thoughtfully confronted with our own mortality and the steps we need to take to in order to go out on as much on our own terms as possible, to not fear death as much and perhaps even look forward to our last hoorah. In wake, we are asked to make an inventory of losses that we have gone through. While I am unaware of what others write, I am surprised by the words that appear on my paper when I allow myself to open up to my losses and my deaths. In our own time, we make our way to the final part of the show: to the memories of those who have gone before us. In the centre of the rooms is a vanitas, perfectly representing the transient nature of life and the certainty of death. The finality of death is depicted with a number of set ups around the vanitas, which include a desk with condolence and in memory cards, a table prepped for a wake with tea, coffee, biscuits and cake and a cupboard filled with clothes, shoes and wigs that will never be worn again. It's a moment to remember those who have died and those who continue living while serving as a gentle push to consider how we want to die and how we want to be remembered. Despite being in a room of strangers, there is an immediate bond created between us through Murray's interactions with us and the openness the audience embraces in sharing our own stories of death and dying. There are many ways to have a funeral and long gone are the days of being placed in a casket and buried underground. There are choices out there, and vigil/wake asks us to research, talk about and prepare for our death so that our death is just as unique and special as our life is. vigil/wake was performed at Arts House between 15 - 17 November 2018.